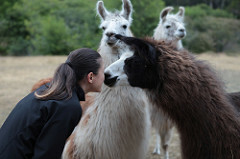 Glendeven is home to four llamas that traveled to the Mendocino Coast with owners John and Mike from their mountain home in Southern California when they bought Glendeven Inn in 2007. The herd contains three females and one little guy. A big girl with orange and white markings. She may give you a kiss if she’s in the mood. Pearl is so named because of her white necklace. She is the only one we have with pure Chilean blood. Dolly—named so because we needed a Dolly Llama and couldn't resist—is orange and white, and is the smallest in the herd. But she is also the Big Boss. She is alpha, and you can see it when you observe how they all interact. 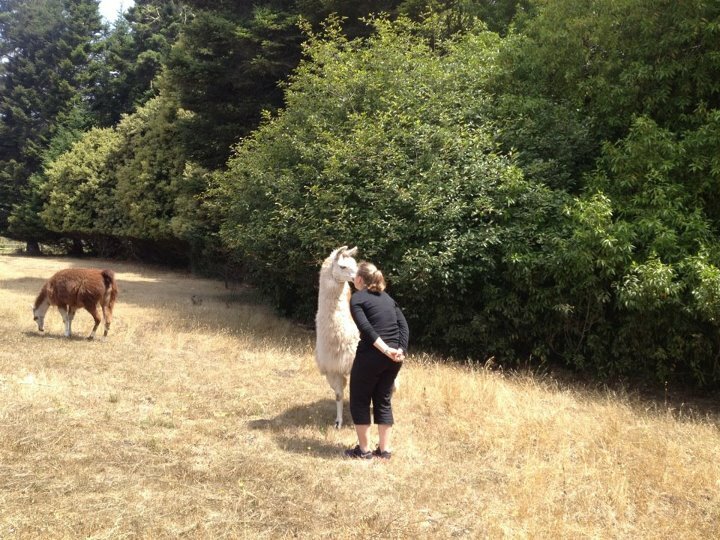 A note about llama "kisses"—the special people (meaning the ones who get lucky) get a llama greeting. As you can see below, they greet each other with a nose to nose "kiss." The baby is Carla. 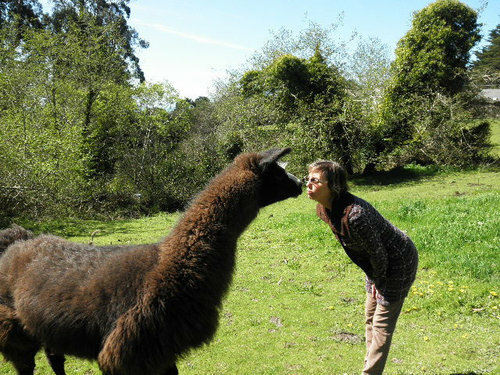 After she stood up for the very first time, and her mom, Mama Llama, gave her that sweet kiss. They are not aggressive, and Glendeven Inn and The Inn at Cobbler's Walk guests are welcome to go out into the pasture, just be sure to close all the gates behind you. Please do not go out in the pasture after dark. These llamas were born in Sonoma County and spent about seven years in Bear Valley Springs, in the southern Sierra Nevada Mountains where John & Mike have a house. Please do not feed them unsupervised – we feed them morning and night, and you are welcome to come and feed them at that time. Llamas do spit, but only at each other to establish pecking order, and generally their tiffs are over food. Their diet consists of browsing on leaves and trees and grazing on grasses. For a treat, and in harsh or dry weather, their diets can be supplemented with hays and grains. They require a low amount of protein – their native habitat is in the Andes at high elevations where forage can be sparse. Llamas are in the genus camelid and are related to camels, alpacas, guanacos, and vicunas. They are originally from the Andes and were the first domesticated animals and are used for their fleece, milk, packing ability, and even meat. But not here. We just have them because we like to look at them. The llama (Lama glama) is a South American camelid, widely used as a pack animal by the Incas and other natives of the Andes mountains. 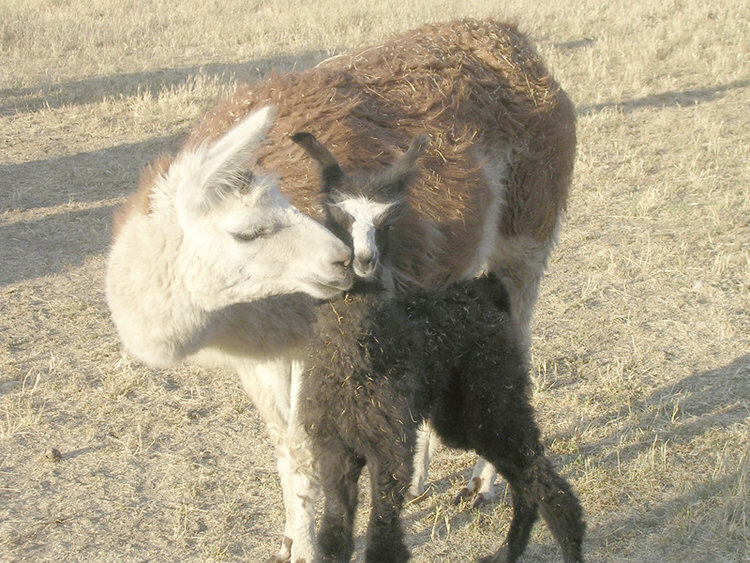 In South America llamas are still used for beasts of burden, fiber production and meat. The height of a full-grown, full-size llama is between 5½ to 6 feet tall at the top of the head. They can weigh approximately between 280 pounds and 450 pounds. At birth, a baby llama (called a cria) can weigh between 20 to 30 pounds. Gestation is approximately 345 days. Llamas are very social animals and like to live with other llamas as a herd. Overall, the fiber produced by a llama is very soft and is naturally lanolin free. Very intelligent, llamas learn simple tasks after a few repetitions. When using a pack, llamas can carry about 25% - 30% of their body weight for several miles. Llamas originated from the central plains of North America about 40 million years ago. They migrated to South America and Asia about 3 million years ago. By the end of the last ice-age (10,000 - 12,000 years ago) camelids were extinct in North America. 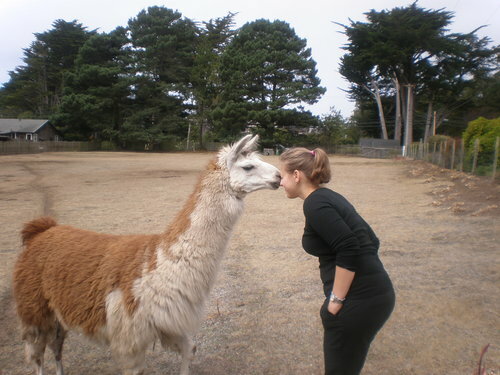 As of 2007, there were over 7 million llamas and alpacas in South America. Due to importation from South America in the late 20th Century, there are now over 100,000 llamas in the US and Canada.